How Long is the Los Angeles River? Creek freak, in record-setting verbosity, takes on the burning question of our day: just how long is the Los Angeles River? And while we’re at it: why is that important? and why isn’t that important? Quick, select “Mark as Read” and move on. The Los Angeles River becomes the Los Angeles River proper in Canoga Park, at the confluence of Arroyo Calabasas and Bell Creek. From there it travels east through the San Fernando Valley, makes a right turn around Griffith Park, passes downtown Los Angeles, then heads south emptying into the San Pedro Bay in Long Beach. It’s not that long a trip. I’ve done it by bike in a day. So… what’s the big deal? It’s only a mile, right? Well, often the struggle to revitalize the Los Angeles River is a struggle to give it respect, even if only semanitcally for now. There were legendary shouting matches between FoLAR founder Lewis MacAdams calling it a “river” and County Public Works calling it a “flood control channel.” If we call it a river, then we can perceive it as one, and will treat it as one. I seem to recall, a long time ago, someone at FoLAR (maybe Lewis, maybe not – I don’t remember) told me the following: Historically the river was 52 miles long. When it was concreted from the 1930’s through the late 1950’s, it was straightened. In straightening, it ended up a mile shorter. As a political and tactical decision, FoLAR continued to call it a 52 mile river because the greater length gave it a greater stature, greater importance. I repeated this anecdote often. On tours I would tell folks that it’s really a 52 mile river, it’s just that it’s trapped in a 51 mile concrete straightjacket. The blog was going to end somewhere around there, but, in doing his due diligence, the Creek Freak decided to try to verify quickly that 52 mile number by poking around some historical sources. Creek Freak’s own and the blogosphere’s generally impeccable credibility would be at state if I post something on the net that some sharp researcher could prove wrong too easily. I figured it would be a quick bike ride to my wonderful library and a search or two in the historical L.A. Times database (which I’ve used before) and I’d be done in less than 20 minutes, and I’d have incontrovertible proof of how right we river advocates are. November 1939: Scientific American, in a 2-page article River Rebuilt to Curb Floods, states “Most important of the streams, insofar as their rampages may affect concentrated population, is the Los Angeles River. This stream, 70 miles in length, may be bone dry in summer, then carry water at a rate of 90,000 cubic feet per second… during a winter flood.” Wow! 70 miles in a peer-reviewed scientific journal! Who knew? This number might correspond to the length of the river before channelization, but I’m guessing that this number perhaps came from including one of the tributaries, maybe Arroyo Calabasas? That’s the oldest reference I found that stated a length for the river – and the longest mileage-wise. July 12 1956: The Los Angeles Times, in an article L.A. River Project Due for Completion in 1957, states “Flood-control work on the entire length of the Los Angeles River, a distance of 49.1 miles, will be completed by December, 1957, Col. Arthur H. Frye Jr., district engineer of the U.S. Army Corps of Engineers, said yesterday.” Ouch, doesn’t 49.1 miles sound rather dinky? It’s more-or-less like the number mentioned on the county’s website above, with a shorter paved distance than total length. I’m guessing that means that they’re not counting one of the soft-bottom areas (either the ~3-mile estuary or the ~2-mile Sepulveda Basin). Perhaps the overall length got mixed up with the completely-paved length somewhere between Col. Frye and the author. March 2 1958: The Los Angeles Times, in an article Timesmen Explore Los Angeles River, states “Last week, after 23 years and $101,100,000, the Army Corps of Engineers completed its project of concreting the bottom and sides of 50.9-mile-long Los Angeles River” The article goes on to describe the Timesmen’s trip, in a 5-person rubber boat, down the length of the river. Other than leaving out the word “the” (shouldn’t it be “…of the 50.9-mile-long?) and that not all the bottom was paved, that extra decimal place makes this entry sounds really precise, really exact. It’s probably right, and the 51 crowd is just rounding it to the nearest mile. 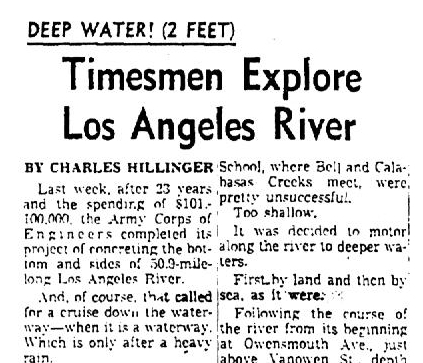 April 1 1958: The Los Angeles Times, in an article Army Engineers’ Field Has Constant Growth, states “The paving of the 50-mile-long Los Angeles River – longest channel of this type ever constructed – was an Army Engineer project.” The fifty mile figure gets quoted in about a dozen articles in the times. I take it as a rounded to the closest multiple of ten estimate. August 1990: The Los Angeles Times Magazine, in an article Mark Twain!, states “I decided to explore the waterway – all 55 miles of it – while it was still neither park nor freeway, to find out what L.A.’s only river was all about.” I’m not sure where 55 came from – maybe the proposed freeway at the time was 55 miles long? Maybe the author rounded up to the nearest nickel? April 20 1994, the Los Angeles Times, in an article River Rescue, states “Its 58 miles are paved with 3 million barrels of concrete.” I can’t really explain this one either, but it’s got a great youthful photo (in color in the original) of FoLAR’s first executive director Martin Schlageter. I decided to check books. In 1975, Anthony F. Turhollow, in A History of the Los Angeles District, U.S. Army Corps of Engineers 1898-1965 (with positively creek-freak-like verbosity and enthusiasm) states (p.146): “One river, the Los Angeles, about 50 miles long, with a source 1,000 feet above sea level is not only at the same elevation as the mighty Mississippi River but also has the same amount of drop in its relatively short length as the Mississippi in its entire course.” In 1999, Gumprecht states (p.1): “Chain link fence and barbed wire line the river’s fifty-one-mile course.” He does mention (p. 228,232) a UCLA researcher who found that as a result of the channelization project the length of the river between between Tujunga Wash and Glendale Boulevard was 28% shorter, going from historically 11.3 miles down to a concreted 8.1 miles . In 2001, Patt Morrison, in Rio L.A., (in her great poetic way) states (p. 21) “For most of its fifty-one miles, it is as unmarked, and as unremarked upon, as a pauper’s grave.” The back cover of that Linton guy‘s 2005 book says 51 miles. As I spent time searching for that elusive confirmation of the 52 mile source, I began to become more and more comfortable with a good fuzzy approximation like “about 50 miles.” It’s very defensible, impossible to prove wrong. I began to geek out on various ideas. Perhaps I could come up with some kind of graph that would show how the river’s cited length changes over time. Maybe I could map it out precisely using old aerials or USGS maps. I could use Gmap Pedometer or (gasp) go out to the field and try to use a bike odometer to measure the current channel’s length. Through all this research and speculation, I began to think in a deeper way about the length of the river. The start of the river at the Bell/Calabasas confluence in Canoga Park is fairly arbitrary. Why not call it the Los Angeles River proper at the confluence of Bell Creek and Chatsworth Creek, located about a mile upstream, and quite equally concrete and anonymous? Why was the current upper river channel designated and not the Tujunga Wash? I’ve heard that many years the Tujunga Wash would contribute more water to the lower river than the upper river did. Gumprecht states (p.136): “The Los Angeles River had seldom been visible west of Encino before flood control, even during heavy runoff.” A lot of the river’s water is underground in the Valley and elsewhere, so it’s arbitrary to just base a river’s starting point on where there’s surface flow. The Los Angeles River frequently moved around across its broad alluvial plains. It meandered its way among many low points in a broad braided channel. It was, as most natural systems are, very dynamic. So it’s really hubris that we humans, whether advocates or flood control engineers, pick a single number and expect it to apply as a constant for a river that changes over time. Any static quantification we do (think average rain year, hundred-year-flood, bank-full width, total maximum daily load) is an approximation – or, perhaps more accurately, a water mark indicating just a point in time. Nature scoffs at these, proving us wrong year after year. It’s important that we do these measurements, that we try to understand the river… but none of us should perceive her in any state as constant, as unchanging. We should learn what we can, but we should expect changes and hopefully surprises, too. This gives me optimism for the future of our river. So… precisely how long is the Los Angeles River? At this point, I’d go with about 50 miles. § 2 Responses to How Long is the Los Angeles River? I have the definitive answer. Can you do the same by running up the Tujunga Wash? I had come to believe that the 58 mile figure I sometimes cited early on was a reference to the length if the river was counted from headwaters of Tujunga. « Upcoming Events: RioFest, Amigos Gala, Stream Hearings! You are currently reading How Long is the Los Angeles River? at L.A. Creek Freak.